* You can try shortening or coconut oil for dairy free. We’ve tried the coconut oil before and it’s definitely something we would have to get used to. Preheat oven to 400 degrees F (200 degrees C). Line your muffin pan with muffin liners. Combine 1 1/2 cups gf flour, 3/4 cup sugar, salt and baking powder. Place vegetable oil into a 1 cup measuring cup; add the egg and enough milk to fill the cup. Mix this with gf flour mixture. Fold in blueberries. 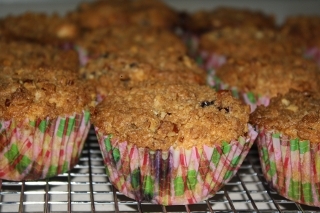 Fill muffin cups right to the top, smooth the batter with a wet spoon, and sprinkle with crumb topping mixture. To Make Crumb Topping: Mix together 1/2 cup brown sugar, 1/3 cup gf flour, 1/4 cup butter, and 1 1/2 teaspoons cinnamon. Mix with fork, and sprinkle over muffins before baking. Bake for 20 to 25 minutes in the preheated oven, or until a tooth pick comes out clean from the center. I’ve also made this as a coffee cake in an 8×8 pan, you just have to cook it for about an hour. Cover it with foil the first half hour so the streussel doesn’t get too dark.